As we moved down the Canning Stock Route (CSR) in 2007, we started getting warning messages on the bush telegraph about a snake in Well 46. We knew that Well 46 was one of the few wells with potable water in it, so we grew a little apprehensive as we approached. The bush telegraph works surprisingly well in many outback locations as well as the CSR and usually involves hand written notes and messages placed in glass jars or tins, or Texta messages on white-boards, located near visitors books or obvious sign posts at key locations. We met almost no one on the CSR so this method of communications is valuable. [Some of the messages go back many years and form a good historical log of the area. A good example of this is the visitors book at Veevers Meteorite Crater, off the Gary Highway, which still has hand written notes from 1975 in it, by the people who discovered the crater (see Gary Highway)]. We first heard of the snake in Well 46 from this anxious note left at Well 49 a couple of months earlier. To make matters worse, this snake (a king brown and potentially deadly), had apparently been caught by the tail in the heavy hinged covers of the well, put in place to prevent animals falling in and polluting the water. The story goes that some previous visitors had opened a cover on the well, saw the snake slithering in or out and dropped the cover in panic, catching the snake's tail between the halves of the covers. Later visitors, concerned about leaving the snake in that situation (ants were eating its trapped tail), tentatively lifted one cover and released the snake which fell into the water, with about 200 mm of squashed tail. So it was quite likely to be a bit angry and aggressive. 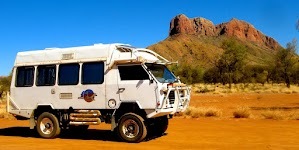 [Note: The Canning Stock Route is a very lonely place and very remote from any medical assistance, so snake bite is something to be avoided at all costs. Well 46 is at least 250 km (and a couple of days hard drive north at 15-20 km/h) over difficult sand dunes from the nearest help at Billiluna, plus another 200 km or so to the nearest hospital at Halls Creek. You would probably not survive a severe snake bite in that time. Your best bet would be an RFDS emergency call on your HF radio or Sat phone for a doctor with a polyvalent antivenin to be waiting at Billiluna airstrip. If a similar event happened further south, there is an airstrip and potential help at Kunawaritji near Well 33, at Parnngurr in the Rudall River National Park and further south still, at Granite Peak Station. Even these places are very remote from major towns or medical facilities and it would be very wise to know First Aid for snake bite before venturing this far away from help. Take a copy of one of these with you: Snake Bite First Aid 1, or Snake Bite Identification and Management, Snake Bite Treatment, and for good measure one of these: CPR Chart. If these sites fail, Google Snake Bite Treatment for Australian snake bite sites. For more detailed info on snake bite treatment refer to the Discussion Notes here. ... and now there appears to be 2 snakes, according to this note. ... and yes, there was one snake (maybe 2), curled up under the timber frame, above the water line. It seemed to be quiet and undisturbed and we still needed some water so we gently lowered the bucket into the water and pulled it up. The snake didn't move as we repeated this noisy exercise (it's a very heavy bucket) a few times, until we had what we needed. Pumping water out of the bucket. However, there was other wildlife around too. As we watched a beautiful goanna slid out from under the frame to sun itself. It watched us as we took its photo. A beautiful sand goanna, probably Varanus gouldii. The downside to this visit was that we left a partially filled bucket of water on the well while we had lunch. Sadly, within 10 minutes, several finches had gone down to the water to drink and fell in and six had drowned. We managed to revive one of them. Finches risking their lives for a drink. We wrote a note on the white board requesting other visitors NOT to leave water in buckets for finches since they seem incapable of getting out, even if a log is left in the bucket for them to crawl up. It's better to pour water down the cattle troughs for them, where it will remain shallow.